32 positive charges of each 8,3E-7 C (300 kV) are placed in the upper horizontal side and in the lower horizontal side, see screenshot and video. A (solitary) sphere with diameter 5 cm and a voltage of +300 kV (to infinity) has a charge of: qi= 3E5/(9E9)* 0.025 = 8,3E-07 Coulomb. 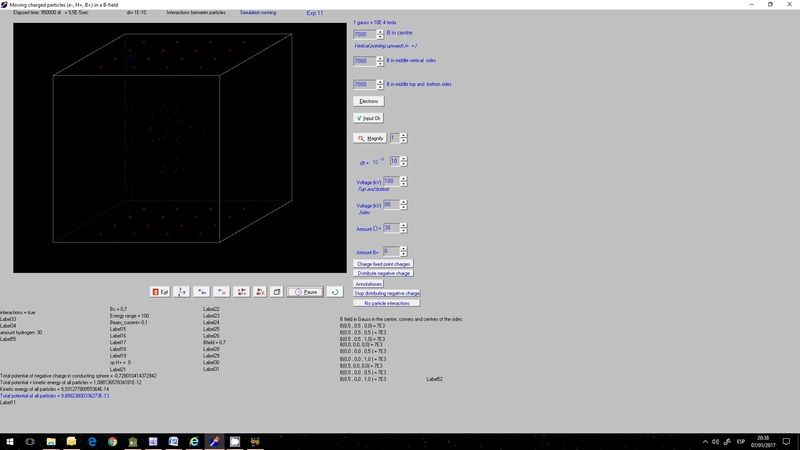 After 1,07E-4 s the positive ions stay confined in the simulation space. The total energy of the ions (kinetic + potential) stayed contant = 2,26 ±0,01E-12 J, which is an indication (but not proof) that the simulation is correct (non-relativistic). 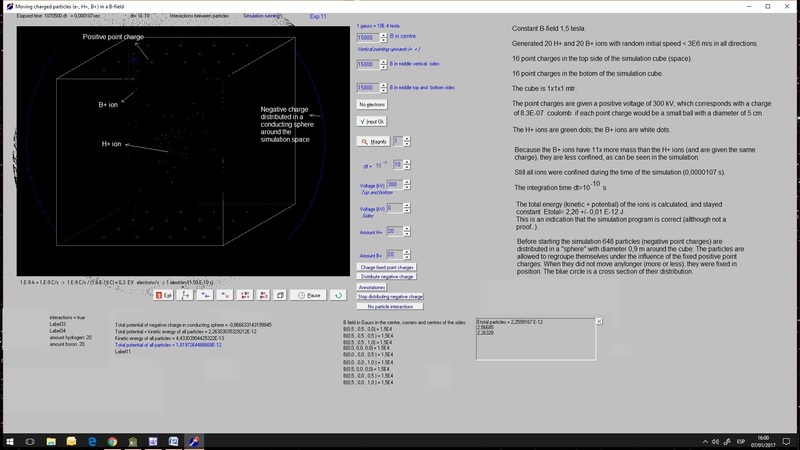 32 positive charges of each 5.56E-07 coulomb (200 kV) are placed in the upper horizontal side and in the lower horizontal side, see screenshot and video. A (solitary) sphere with diameter 5 cm and a voltage of +200 kV (to infinity) has a charge of: qi= 5.56E-07 Coulomb. After 7,5E-5 s the positive deuterium ions stayed confined in the simulation space. The total energy of the ions (kinetic + potential) stayed contant = 1,68 E-12 J, which is an indication (but not proof) that the simulation is correct (non-relativistic). 32 positive charges of each 2.78E-07 coulomb (100 kV) are placed in the upper horizontal side and in the lower horizontal side, see screenshot and video. A (solitary) sphere with diameter 5 cm and a voltage of +100 kV (to infinity) has a charge of: qi= 2.78E-07 Coulomb. After 9.4 E-5 s the positive deuterium ions stayed confined in the simulation space. The total energy of the ions (kinetic + potential) stayed contant = 1,08 E-12 J, which is an indication (but not proof) that the simulation is correct (non-relativistic).